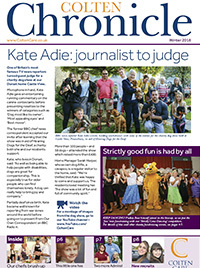 One of Britain’s most famous TV news reporters turned guest judge for a charity dog show at our Dorset home Castle View. Microphone in hand, Kate Adie gave an entertaining running commentary on the canine contestants before presenting rosettes to the winners of categories such as ‘Dog most like its owner’, ‘Most appealing eyes’ and ‘Best mover’. 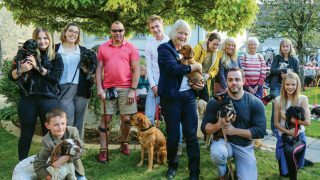 The former BBC chief news correspondent accepted our invite after learning that the show was in aid of Hearing Dogs for the Deaf, a charity both she and our residents support. Partially deaf since birth, Kate became well known for reporting from war zones around the world before going on to present From Our Own Correspondent on BBC Radio 4. More than 100 people – and 58 dogs – attended the show which raised more than £400.